Hiya! This is Kristen here for February's income report. Today is the one day a month that I share what goes on behind the scenes here at TEM. 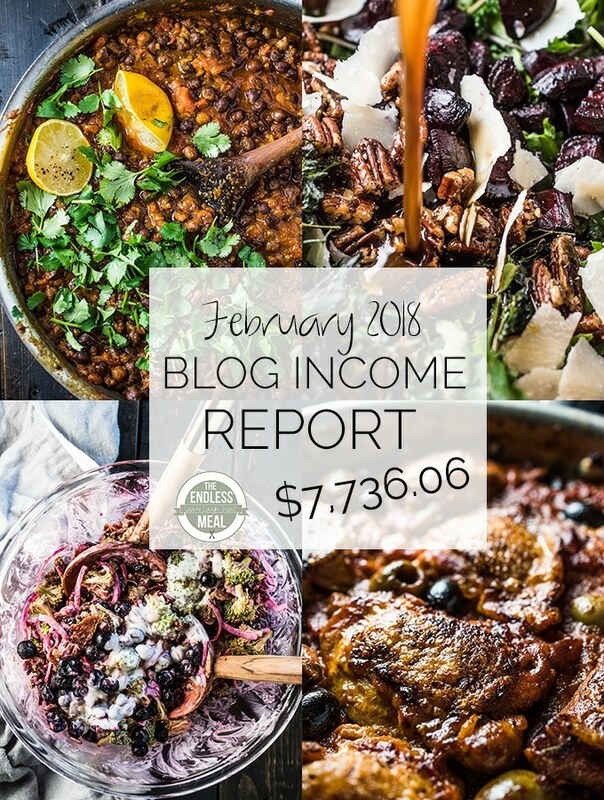 I share where the income comes from, what expenses there are, and some tips for fellow and dreaming to become food bloggers. This past month, we've made some changes to how we approach Facebook. While the jury is still out on the success (or not) of our new strategy, I do have some tips to share. These are some back pocket tricks I've learned to help grow our FB page. 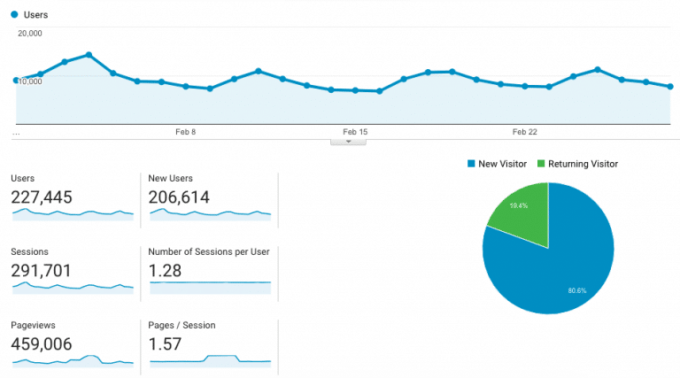 Before we get to the tips and tricks, let's go over the numbers and traffic first …. Invite people to like your page. And I'm not talking about friends and family. Facebook has a handy little tool that lets you invite people to like your page if they've liked one of your posts. To do this, click on who has liked your post. A box will pop up with the names of everyone who has clicked the like button. Next to their names will either be a greyed out box that says ‘Liked' or a blue box that says ‘Invite'. If you click the Invite button that person will get a notification asking them to like your page. Facebook lets you choose which content you would like highlighted on your page. It's called Featured Content. On TEMs Facebook page, we have videos first, photos second, and then we show the rest of the posts. What's great about choosing featured content is that you can pick the very best photos you've posted. And because you are choosing from photos you have uploaded to Facebook, they don't need to be your photos. That amazing looking minestrone soup at the top right is a picture from The First Mess. Of course, when someone clicks on the photo, there are two links in the caption. One links to her Facebook page and the other directly to the recipe on her blog. Have you heard of Facebook Juice? I've even heard it called Fairy Dust. It's the idea that Facebook favors popular posts. One way to harness a little of this special fairy dust is to share your posts that other people have shared. But how do you know when someone shares your post? If it's a new share, you'll get a notification about it. To track down shares on an older post, you'll want something called Crowd Tangle. It's a free Chrome extension. When you install it, go to a page on your website then click on the Crowd Tangle button in your toolbar. It will bring up all the shares social shares and let you know how many times it has been reshared. Using it, I was able to find this share on the Real Housemoms' Facebook page from July 22nd, 2016. I shared it on our Facebook page to keep the Facebook Juice flowing. 99% of the time we share our Facebook posts with everyone. But, once in a while, we have a post that's not meant for everyone. That happened this week. Earlier this week I shared a recipe for some Sesame Pineapple Sausage Bites. Have you seen it? They're so delicious. Along with the recipe, we are hosting a giveaway of the sausages used to make the bites. While the recipe is (obviously!) for everyone, we are only able to ship the sausages to a Canadian address. When promoting the giveaway on Facebook, I used this Preferred Audience Tool so that those posts would only be shown to Canadians as I didn't want to tease followers with a giveaway they couldn't enter. Using this tool, you can choose to include or exclude followers based on age, gender, location, language, and interests. Do you have any Facebook tips or tricks up your sleeve? If you do, share them in the comments below so we can all learn from each other! I really hope you show more expenses on your tax return! Food, mileage or travel possibly. Hopfully, you don’t have to give Uncle Sam all the beans. The food expenses do get calculated for taxes! Unfortunately, I’m not able to deduct the wear and tear on the bike I use to get around the city. I wish I could! Thanks for your report. It is very encouraging. There are a few additional cost I would expect to see like food cost, cell phone and mileage. Thanks so much for sharing this. It’s so helpful to see what it takes to begin to make money with a blog. We included your data in a couple charts comparing different food blogs to see how they typically monetize. I thought you might like it. Here’s the link for the food blog monetization benchmarks. Thank you so much for including The Endless Meal! Hey Kristen! Will there be any new income reports coming? I’m terribly behind on them! Life got busy with some holidays earlier this year and I’m still playing catch up. But to answer your question … yes! Yay! Looking forward to reading them Kirsten. They are really helpful and insightful! It is wonderful you share this information! I’m so happy you find it helpful! I was wondering, what do you use to check your pageviews. I saw your screenshot in your income report and in other people’s income report but I don’t know how to check it. Is it a plugin you use or a website? Any help you can provide will be helpful. Thanks. That’s a great question! What we use is Google Analytics. Once you sign up (it’s free!) you’ll need to install a piece of code that they give you on your site. After you’ve done that you” have access to all sorts of information about who is visiting your site and what they are looking at. Not personal information, of course, but general information that can be really helpful. You’ll know where your readers are coming from and the pages that are most popular on your blog as well as a ton of other stats. Once you get to the point where you’re doing sponsored work you will have to have Google Analytics installed as most advertisers will want to know how much traffic your site gets as well as how much traffic the sponsored post you did for them received. Thanks a bunch. I really appreciate that.